Does one unit need to perform a variety of functions? Combi units are praised for their versatility, but keep in mind that one unit alone cannot perform two tasks simultaneously. If you plan to utilize your combi oven for different functions at the same time, then you may want to opt for two units stacked on top of one another. Otherwise, you can simply purchase one unit with the knowledge that only one function may be in use at any given time. Do you need a boilerless or steam generator unit? Injects water directly into the heating element. Uses a tank to boil water, producing steam that gets injected into the oven. Best for hard water conditions, requires more preventative maintenance. How many sheet pans will you need to fit into the cavity?This depends on your volume output at the highest peak traffic times, so don’t simply purchase a size that fits your ‘regular’ business day. Always oversize! Combi units can fit 6, 10, or even 20 sheet pans. Typically more efficient, these open burner models directly transfer energy, heating up the cavity instantly. You’ll still need an electric connection for the controls and fans. While typically more affordable than gas counterparts, these are best reserved for those in higher elevations where gas may not work most efficiently. Also, smaller units tend to be electric. With a combi oven, you can replace your proofer, holding cabinets, and even slow cookers in favor of smaller footprints and less equipment in the kitchen. Since the footprint under the hood is smaller then having multiple units, there is space and hood size savings. Also, by adding convection oven cooking to a steam cooker, you end up with plumper products that taste and look better. 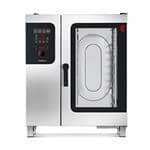 There are three modes of cooking that a combi unit can be utilized for: Steam, Convection, and Combination cooking. 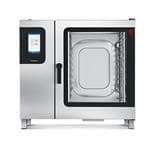 Keep in mind that most combi ovens have self-cleaning features, but you’ll need to check your user manuals or manufacturer recommendations in order to know which cleaning solutions or tablets will work best for your particular unit. In addition, because a combi oven uses water that is turned into the system, you’ll always want to use a filtration system for the incoming water. Without filtration, you run the risk of mineral buildup and scale deposits within the water lines, heating units, and cooking chamber of the oven. Additionally, cleaner water can contribute to better tasting foods as well!